July 5, 2000 -- Later this month a fuzzy blob will glide across the sky near the Big Dipper. 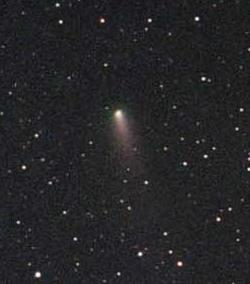 Called "C/1999 LINEAR S4", or LINEAR-S4 for short, it's the brightest comet to come along in more than 3 years. Comet LINEAR-S4 was discovered on September 27, 1999, by the Lincoln Near-Earth Asteroid Research program in New Mexico. It appears to be a first-time visitor to the inner solar system traveling in an orbit that will return it beyond distant Pluto after it passes 114 million km from the Sun on July 26, 2000. "Estimating how bright this comet will become is tricky," says an astronomer at the NASA Marshall Space Flight Center. "Comet LINEAR hasn't been here before so we can't use past experience as a guide." If these projections are correct, LINEAR-S4 will put on a modest show compared to the great comets of 1996 and 1997, Hyakutake and Hale-Bopp. At its brightest in March 1996, Hyakutake was a 1st magnitude object sporting a tail that stretched 60 degrees across the sky. Comet LINEAR-S4 will probably be 20 to 100 times dimmer than Hyakutake and its tail will look more like an elongated smudge than a sky-rending blaze of light. Nevertheless, comet LINEAR-S4 could be a beautiful sight as it moves through the relatively star-poor area around the Big Dipper in late July. In fact, if the comet reaches 4th magnitude it will probably resemble another popular fuzzy blob, our nearest neighboring galaxy, the Andromeda Nebula. Experts stress that predicting what LINEAR-S4 will do is more of an art than hard science. The comet might fail to develop or it could be far more striking than expected. Above: Comet LINEAR-S4 is expected to reach peak brightness around July 23, 2000. Skywatchers in the northern hemisphere should look for the comet near the Big Dipper around 9 p.m. local time approximately 30 degrees above the northern horizon. Although the comet will appear to be stationary when viewed for a short time, it is actually moving 8 degrees per day with respect to background stars. (The bowl of the Big Dipper is 10 degrees across.) The comet will move past the Big Dipper in just a few days. To view finder charts for other dates, visit Sky & Telescope and CometLinear.com. Note for Southern Hemisphere observers: when comet LINEAR is brightest on July 23 it will be impossible to view from most southern latitudes as it rises just a few degrees above the horizon during the day. In August the fading comet will be a good target for southern telescopes for a few hours after sunset. LINEAR-S4 is expected to become a naked-eye object around July 17, 2000, when it brightens to 6th magnitude. Even if the comet eventually reaches 4th magnitude, it will be invisible in light polluted urban areas. Dark skies are essential. For comet watchers, this is a good time for a vacation in the country! By the end of 2000, LINEAR-S4 is expected to be a faint 13th magnitude object, fading as it races back to the outer solar system. Comets like LINEAR-S4 may originate in the Oort Cloud, a giant reservoir of comets 50,000 AU from the Sun. (One AU is an Astronomical Unit, 149.6 million km, equal to the average distance between the Earth and Sun.) Although the Oort Cloud is speculative, many astronomers believe that it exists and is populated with icy relics from the formation of the solar system more than 4 billion years ago. Occasionally a galactic gravitational perturbation tweaks the orbits of the Oort comets and sends some of them plunging toward the Sun. Comet LINEAR-S4, with its highly elliptical long-period orbit, is probably one of these. After it passes by the Sun later this month it may not return for millions of years, if ever. Right: This 10-minute exposure of comet LINEAR S4 was captured in Austria on June 28, 2000. Copyright © 2000 by Michael Jäger and Gerald Rhemann. Although we probably won't see comet LINEAR-S4 again after this summer, it's almost certainly not the last "Comet LINEAR." The LINEAR project has discovered more than 40 new comets since 1998 and shows no signs of slowing. Will this Comet LINEAR be worth watching? Only time will tell. The best way to find out is to go outside and look! Science@NASA readers are invited to send their descriptions and photos of Comet LINEAR to the editor for possible inclusion in future articles about this comet. The nucleus of a comet is an irregular ball of ice and dust typically 1 to 10 km in diameter. When the nucleus approaches the Sun, sunlight warms the surface and the solid ice sublimes (turns to vapor). The resulting cloud of water vapor and carbon dioxide surrounding the nucleus is called the coma. Most comets come from the most distant reaches of the solar system, far beyond the orbit of Pluto. By the time they are as close to the Sun as the Earth, the coma can be larger than Jupiter. Together the coma and the nucleus form the head of the comet. Right: This image of Comet Halley's nucleus was taken by the European Space Agency Giotto spacecraft during a flyby on March 13, 1986. Scientists estimate that about 10% of the surface was boiling off into space. The stuff that boiled off Halley in 1986 may one day be seen again during an eta Aquarid meteor shower. Above: This photograph of Comet Hyakutake highlights different components of the tail. The gold and red tail features are dust, made predominately of little bits of rock and carbon. The dust tail shines by reflecting sunlight. Extending past the dust tail is the comet's ion tail, shown here glowing in blue. The ion tail is composed mostly of ions of water, carbon monoxide, and cyanogen. The ion tail glows by emitting light when elections re-combine with electrically charged ions to make uncharged molecules. Comet LINEAR's Summer Show - from Sky & Telescope, includes detailed finder charts and ephemerides. C/1999 S4 (LINEAR) -- images and historical highlights from Gary Kronk's popular Comets & Meteors web site.